One such service is our ability to produce customised load pins for customers to suit exact specifications. This service has been specifically tailored for customers who have a recurring need to satisfy volume manufacturing and distribution. Flintec offer load pins in two configurations, which include externally strain gauged and potted or down-hole bonded strain gauged. The down-hole bonded load pins are laser welded to offer complete hermetic sealing to IP69k levels of protection. 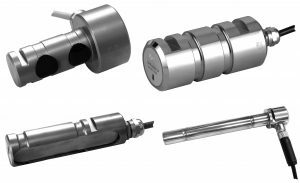 General load pin applications include crane and hoist load monitoring, as well as, numerous applications in mobile machinery and industrial measurement. The plethora of applications mean that it’s challenging to find an “off the shelf” sensor that matches individual specifications. As with all Flintec products, we strive for excellence to ensure the sensors we deliver are not only reliable and accurate, but will also work in the most challenging of environments. Our highly skilled group of engineers are regularly assigned to work on customised projects to ensure that new technologies developed by Flintec meet our, as well as your, standards of excellence. For further information, contact your regional sales representative, who can help define and deliver you individual needs.